This very brief post was prompted by a question from Richard Allen on Twitter. Martin Jol resided over Fulham until the end of November, and here are the Shot Charts for his Fulham team at the time Jol was sacked. If you require an explanation of the zones used in these images please scroll down to the bottom of this article. Otherwise we’ll jump straight into the charts. 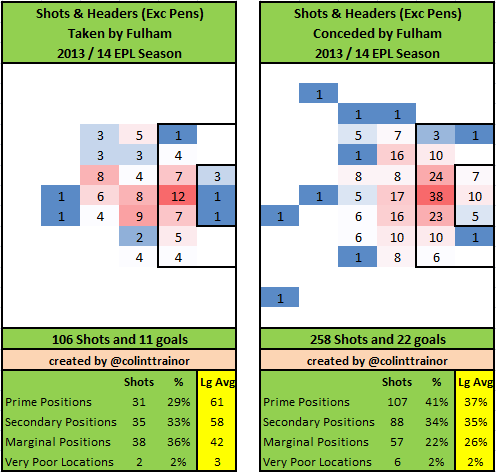 Fulham conceded more than twice as many shots as they gained, and their own poor shot quality combined with the above average quality of shots allowed mean that they conceded more than there times as many Prime location shots as they generated themselves. They also shot far too often from Marginal Positions. All in all, I firmly believe that Jol was lucky that his team only conceded 11 more non-penalty goals than they scored under his reign. He really had Fulham playing abject football. Jol was sacked on 1st December and was replaced by Rene Meulensteen with an almost immediate improvement in results and performances. Although recent results, including a 6-0 tanking by the mighty Hull and a home defeat to Sunderland yesterday suggests that the “Rene impact” has been short lived. What can we learn from the Shot Charts in the games since 1st December? For a start Fulham have had more shots under Meulensteen than they have conceded – so that’s a clear improvement. Their split of shots between zones is bang in line with the EPL average (37% from Prime and 34% from Secondary positions). 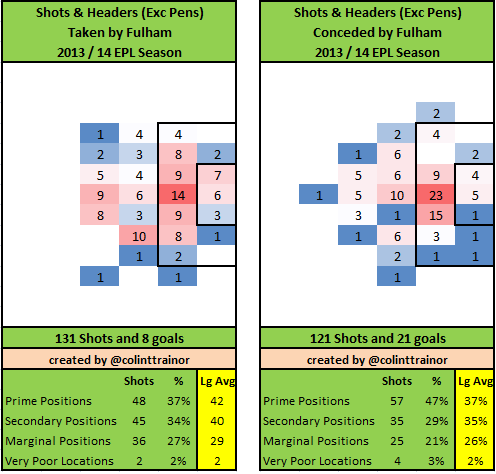 So I can answer Richard Allen’s question by saying that Rene has improved the positions where Fulham have been shooting from and it’s not a case that the increased shots are just superficially better. From a defensive point of view, Fulham under Meulensteen have a huge problem with where they allow shots to be taken from. Almost half of the shots they allow have come from the Prime Zone – that’s a hole that will need to be rectified quickly if Fulham want to escape relegation. However, even including that worrying defensive wrinkle I would suggest that Meulensteen has been most unfortunate to have conceded 21 goals from 121 shots. That is virtually the same amount of goals (22) that Jol’s Fulham conceded from a whopping 258 shots. I had been pretty vocal all season that Fulham were atrocious under Jol and that their underlying numbers were much worse than the results they were getting. Whether that was because of good fortune or variance we will never know, but his replacement Meulensteen is in the unfortunate position of being on the receiving end of the variance levelling itself out, ie the results he has been getting are not as good as the underlying stats would suggest. Sometimes, that’s just the way the dice rolls. Each team plot has two images. The image on the left reflects the shots (excluding penalties) that the team has taken this season, while the image on the right sets out the shots they have allowed. 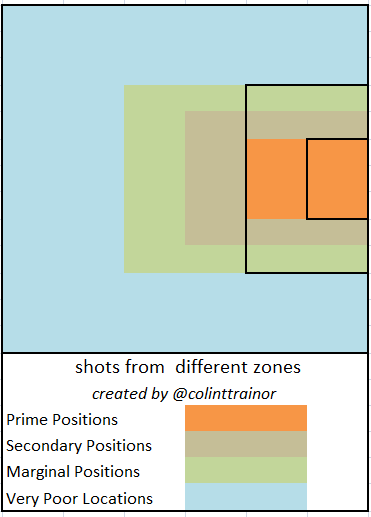 The table underneath the image summarizes the shots by zone, and in order to aid comparison the numbers highlighted in yellow are the league averages.